Abstract triangle mesh base class. Create a new, empty triangle mesh with the specified state. This is an alternative routine, which only loads triangle data (no BSDF, Sub-surface integrator, etc.) in a format that will remain stable as Mitsuba evolves. The files can optionally contain multiple meshes – in that case, the specified index determines which one to load. Create a new triangle mesh. force When this parameter is set to true, the function generates normals even when there are already existing ones. Generate per-triangle space basis vectors from a user-specified set of UV coordinates. Will throw an exception when no UV coordinates are associated with the mesh. Build a discrete probability distribution for sampling. Create a triangle mesh approximation of this shape. Since instances are already triangle meshes, the implementation just returns a pointer to this. Import a shape from the Blender in-memory representation. Return a bounding box containing the mesh. Return the number of primitives (triangles, hairs, ..) contributed to the scene by this shape. Return the derivative of the normal vector with respect to the UV parameterization. This can be used to compute Gaussian and principal curvatures, amongst other things. Return the total surface area. Return the number of triangles. Return the per-triangle UV tangents. Return the number of vertices. Return the vertex texture coordinates. Does the mesh have UV tangent information? Does the mesh have vertex colors? Does the mesh have vertex normals? Does the mesh have vertex texture coordinates? 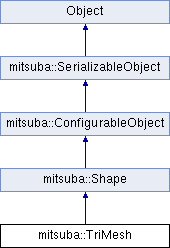 Load a Mitsuba compressed triangle mesh substream. Query the probability density of samplePosition() for a particular point on the surface. This method will generally return the inverse of the surface area. pRec A position record, which will be used to return the sampled position, as well as auxilary information about the sample. Prepare internal tables for sampling uniformly wrt. area. Reads the header information of a compressed file, returning the version ID. This function assumes the stream is at the beginning of the compressed file and leaves the stream located right after the header. Read the idx-th entry from the offset diccionary at the end of the stream, which has to be open already, given the file version tag. This function modifies the position of the stream. Read the entirety of the end-of-file offset dictionary from the already open stream, replacing the contents of the input vector. If the file is not large enough the function returns -1 and does not modify the vector. This function modifies the position of the stream. Rebuild the mesh so that adjacent faces with a dihedral angle greater than maxAngle degrees are topologically disconnected. On the other hand, if the angle is less than maxAngle, the code ensures that the faces reference the same vertices. This step is very useful as a pre-process when generating high-quality smooth shading normals on meshes with creases. Note: this function is fairly memory intensive and will require approximately three 3x the storate used by the input mesh. It will never try to merge vertices with equal positions but different UV coordinates or vertex colors. The returned sample density will be uniform over the surface. Serialize to a file/network stream. This is an alternative routine, which only loads triangle data (no BSDF, Sub-surface integrator, etc.) in a format that will remain stable as Mitsuba evolves. Export a Wavefront OBJ version of this file. Export a Stanford PLY version of this file.